...There was a PT who started their journey as a gym instructor, aged 36, having previously been a company director in another industry. In the 4 months they served as gym staff, waiting for their chance to don the prized shirt that said ‘Personal Trainer’ on the back, they cleaned machines, showers, toilets, opened the gym early and closed the gym late, wrote programs for new members and generally did the tasks considered more ‘menial’. That time was incredibly valuable. The new employee engaged with the members in conversation, was helpful, discovered who they were and their reasons for using the facility. Each day was a new opportunity to know people better, with no agenda, other than to be of service. The day came when this gym instructor was given the shirt that matched their qualifications, which caused some surprise, given the gym had only 1,000 members and 10 well qualified and experienced PT’s. After one week, the new PT had already signed 7 clients. Within 3 months, they were the busiest PT at the gym. What had happened? If there was such a latent market for PT’s at this gym facility, with highly qualified people waiting to help, why did the new PT become so successful? Simple, he knew how to connect on the human level. (Yes, it was me). As my friend Ian O’Dwyer would say, “I don’t tell this story to impress you, but to impress upon you” the importance of connecting with people. It’s not taught in qualifications, and yet it’s possibly the most vital tool anyone in our industry can learn and practice. And, it’s easier than you think! Research into exercise adherence has shown it is “associated with motives focused on enjoyment, competence and social interaction, but NOT with motives focused on fitness or appearance“(1) . Further, that it needs to be “intrinsically motivating” to participants like friendship, rather than like anything relying on “extrinsic motivation, such as the expectation of improved health and well-being”(2) . In other words, all that in depth knowledge on the workings of the human body is very useful, but it’s not why people return. It’s the connection with the human being that counts. Why is this? Well, Tony Robbins describes love/connection as one of our 6 basic human needs. The need to belong to something, to be part of something bigger than ourselves. Examples would be family, nature, a hobby and indeed, exercise, when we include connection. Are there strategies for those that aren’t sure where to start? Well, PTA Global have two excellent tools – the Program Design Questionnaire (PDQ) and the Kaizen 6 feedback tool. 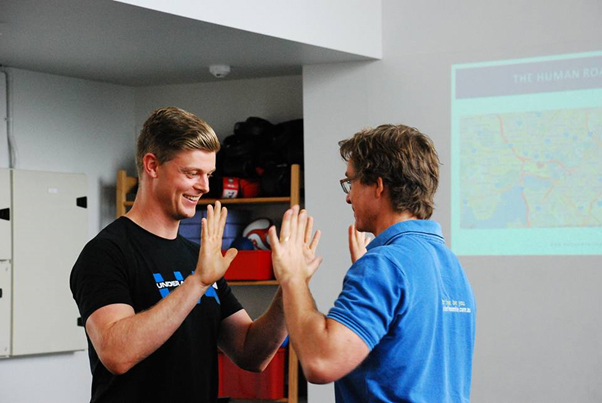 The PDQ is a powerful and short set of questions that will unveil the goals, movement style, exercise level and motivation behind someone’s goal, along with a starting point for your first session. This will take you around 10 minutes, tops. Pair this with the Kaizen 6 after your first few sessions (which asks questions such as “what can I do to make your experience with me even better?”) and you’re making the entire process - from initial meeting, through the sessions to reviewing those sessions - all about the client. You know them better, you learn more about them, you use that information to improve your service and you continue to do this to ensure consistent connectivity. How connected are you now? You can even adapt the Kaizen 6 to each exercise in the client’s session to “physically match and emotionally attach” (as PTA Global would say) your client to their experience. An example would be a new client session I delivered a few days ago. We’d previously been through the PDQ, then during the session I’d ask my client to score the exercise she’d just finished out of 10, based purely on their enjoyment of the exercise. If we get an 8, I’d ask how we’d make it a 9? And so on for each exercise. The guidance all comes from the most important person in the room – your client. Do they feel special and heard? You bet! This all sounds like common sense, right? I agree. It also means hard work, consistency, dedication, determination, and action. In her book Grit , Angela Duckworth explains it’s not talent that leads to success. It’s passion and perseverance the most successful people in the world demonstrate, from all industries (3). You must put in the work required to truly and authentically connect by doing the simple things ferociously well, again, and again, and again. I’d like to make a final point about play as a form of connection. Once you know someone’s movement style (traditional, hybrid or progressive), you will know what type of play they may respond to best. Build yourself into that play and you’ve just connected. No conversation required. Just movement. The photo above shows a simple hand reaction drill that many in the PTA Global community use. Can you see we’re instantly connected, even though we haven’t met before? As I’ve heard many times, there is no motion without E-motion. If you’re looking for the fast track to connection, you may just want to become skilled in game play for all movement personalities. I think with some dedication and smart tools like we’ve discussed above, the ability to connect can take you far. Further than a successful business. It can bring you to an integral place in peoples’ lives. You become part of their everyday life experience. You become a guide, confidante and leader - a leader of both individuals and groups. Where you choose to take this is entirely up to you. Suddenly , your options become limitless. Leadership after all, is required everywhere. So how was this article for you? Was there anything I could have covered that would have made it better? Was there anything you’d like to have removed? How would you rate it out of 10? How could I make the experience of reading this article one or two points better? I’d like to know. Honestly! This is about you, not me. Ryan, R.M., Frederick, C.M., Lepes, D., Rubio, N., & Sheldon, K. (1997). Intrinsic motivation and exercise adherence. International Journal of Sports Psychology, 28, 335-354. Nielsen, G., Wikman, J.M., Jensen, C.J., Schmidt, J.F., Gilemann, L., & Andersen, T.R. (2014). Health promotion: The impact of beliefs of health benefits, social relations and enjoyment on exercise continuation. Scandinavian Journal of Medicine & Science in Sports, Suppl 1, 66-75. Duckworth, A. (2017). Grit: The power of passion and perseverance. New York, NY: Scribner.